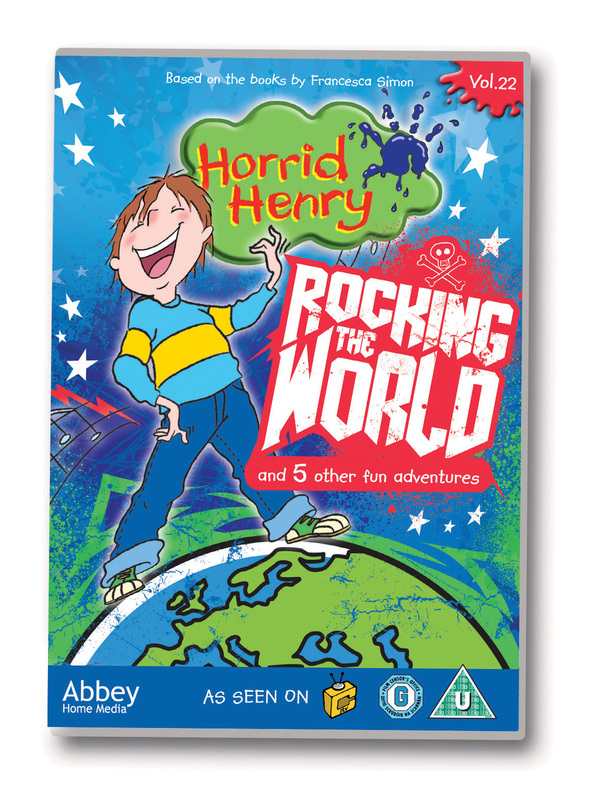 Horrid Henry: Rocking the World DVD is the new Horrid Henry DVD to be released by Abbey Home Media. Having two fans of Horrid Henry’s antics in the house I knew this would be a hit, something they would enjoy watching and would keep them entertained. This DVD contains new episodes from series 3 of Horrid Henry all of which see Henry get up to his usual mischievous antics. It really does keep little ones entertained seeing Henry do all the naughty things they often long to do but know is wrong. Five year old Miss M really finds Henry funny and laughs out loud at some of his capers. During this new dvd, she was literally glued to some parts, saying “Shh mummy, this bits really funny, I need to watch it”. I think that confirms that it has been a hit with my children and as ever bit as entertaining as previous Horrid Henry dvd’s. The DVD is released on 23rd September 2013 and can be purchased from all good DVD stockists. For more information can be found on the Abbey Home Media website or their Facebook and Twitter pages. This entry was posted in Giveaways, Reviews and tagged abbey kids, DVD, giveaway, giveaways, Horrid Henry, review, rocking the world by Fiona Martin. Bookmark the permalink. My youngest daughter used a WHOLE tub of my E45 cream on her legs – she was white and it took ages to get off (and from the carpet too) The only good thing was – her skin on her legs is ultra soft lol! My son took the tin of biscuits and ate them ALL in his bedroom! emptying a very full hole punch contents all over the living room floor! WHEN MY SON WAS LITTLE HE BURIED A LOAD OF HIS TEDDIES AND TOYS IN THE GARDEN. My niece hid under my sister’s bed with a box of chocolates and she couldn’t be found anywhere,it took ages to find her and my sister was really panic stricken! ate my chocolate and lied thru his teeth. Playing with play -doh on the carpet and smearing it in! My daughters loves Horrid Henry. Coloured himself in with green felt tip pen claiming he was now a frog!! Picking all the cherries out of my soaking dried fruit for the Christmas cake! Pinching a sweet out of her box just before dinner. My little one is in to ripping addresses off of envelopes for the recycling box and did it to an unsent card. Annoying as it also ripped the card but he was trying to be helpful so not so naughty! Son did toilet in unconnected B&Q bathroom display! I was never naughty, I was an angel. Honest. One of the little horrors on our row scribbled on our campervan in biro!!!! I was speechless! ripped the toilet roll into single sheets to make a wall ! my friends little boy decided to give their dog a bath with his juice! My daughter wrote her name on her book case and then blamed it on her brother who was only 6 months at the time!! Felt tips on the wall! My nephew squirted me in the face! I accidentally left the tap on once and it went through the floor and almost brought the ceiling down. My son and daughter age 5 & 6 thought it would be hilarious to put a pretend spider in my bed! My daughter recently posted a whole toilet roll down the loo! Locked mum out of the house as she threw out the rubbish so that he could raid cheese in the fridge! Had to call the fire brigade to get back in! my daughter got in my pantry once and made a lovely mess over herself and the pantry with a mix of orange squash flour and cocoa! colouring her eye lids with felt tip pen, took ages to get off. hiding biscuits in his pockets and making it look like he only took one! Ate all the food in the house. My daughter poured juice into the keyboard of my pc because apparently “it needed cleaning”!! My older daughter when she was 4 used a purple felt pen to join the dots on our Dalmatian dog. Raiding my makeup bag and getting red nail varnish on my bedroom carpet. makeup all over my bed! My son is terrible for drawing on things. My partner left a red permanent marker on the PC desk which I kept telling him not to, our son coloured in the whole PC monitor with it. It took my partner ages to scrub it all off, lesson learned hopefully! Too many to mention, one of his favourites latley is covering the dog in mummy’s make up ! It is drawing ‘boobies’ on every art thing she does. She fixated with the word and has to draw them. covering a chaise lounge in boot polish! as my sister reached down to pick something off the shelf in the supermarket my niece decided to kick her in the bum! Deliberately making mess by spilling cereal all over the floor! A friends son periodically stuffed unwanted food down the back of the radiator in tissues!!!!!! The most naughtiest thing I done as a little one was decided to keep a garden snail as a pet then I forgot about it and my mother had a lovely suprise when she tidied my room! my daughter got hold on some nail scissors this afternoon and decided to play hairdresser with her twin sister. safe to say they dont look alike anymore. My two year old is so cheeky the last thing he did that was naughty but funny was he turned round bent over and made a fart noise at everyone and hes always blowing raspberries at people. Today I saw couple of kids in the pub eating with their parents, they were not allowed to have any drinks because they were naughty a day before. When mum and dad left a table for a few minutes, they ordered a drinks without permission. Wrote her name on Grandma’s bathroom wall! Putting foam up his nose. My middle daughter wanted to make a new outfit for her Barbie doll, so she took her safety scissors and decided to cut a chunk out of my lounge curtains!!! So much for being supervised by granny!! My son squirted toothpaste in my hair! My daughter painted the radiator with nail polish!!! My son put a packet of jaffa cakes in the shopping trolley, my husband and I both thought the other had put them in and we only realised his trick when we got home! My daughter decided to tip a packet of rice onto the kitchen floor … fun, fun, fun! Tried to sneakily eat a tub of chocolate nesquik powder – the evidence was obvious….everywhere! wrote on my living room wall! Tipping a whole new pot of cotton buds down the loo! Cutting her own hair the day before her first day at school. Not a good style either. Put a shoe down the toilet.